High school standout and Division I college athlete Brooke Heyne describes her road to recovery after an injury. She had played in hundreds of volleyball matches, defended the net, scored kills, won games for both her club team and Skutt High School. It was different on February 20 for Brooke Heyne, when she landed oddly after a jump. Her senior high school season ended with a state title and being named the Nebraska Gatorade Player of the Year. Next up: continuing her playing career in Manhattan, Kansas for the Wildcats of Kansas State University. But her bright future was suddenly a little more gray. Heyne turned to her future coaches and athletic trainers and was eventually connected with Kevin Grosshans, MD at OrthoNebraska. After meeting with Heyne, Dr. Grosshans recommended reconstructive surgery and a lengthy rehabilitation program. Early rehab was a challenge for someone as active as Brooke. Movement and activity were progressed slowly to allow for her ankle to heal while her ligaments became more stable in a walking boot. “Therapy for my ankle was hard in the beginning. I had therapy before for a knee meniscus injury, and that was simpler. I spent more time on a scooter and with crutches this go around,” she recalled. Once cleared to begin working outside of her walking boot, Brooke’s drive to return to her previous level took over. She was quickly able to begin more advanced activity, return to running, jumping and even some light volleyball drills. 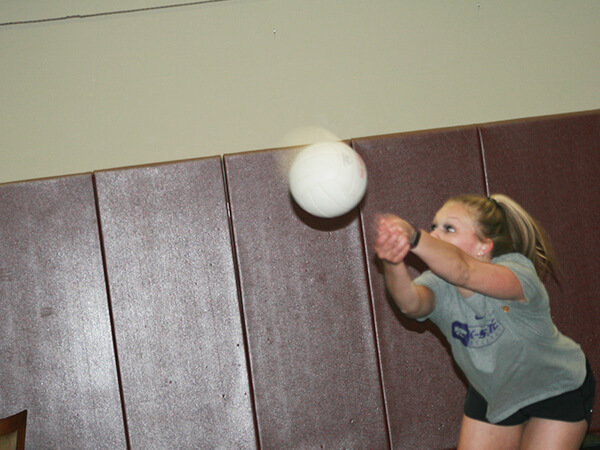 She displayed the type of work ethic that had gotten her to an elite level, focusing on rebuilding her flexibility, balance and strength for her return to volleyball. Just recently, the Omaha World Herald reported that Brooke has been named the National High School Coaches Association (NHSCA) senior volleyball athlete of the year. For more information on physical therapy or sports rehabilitation, or you can call (402) 609-1750.